But, anyways - having had the protos running and playing with them, I'm re-evaluating. The Dual Clock doesn't feel particularly useful! The DDSR I'm at least very happy with! The Logic/Switching module hasn't yet got happy for various reasons. 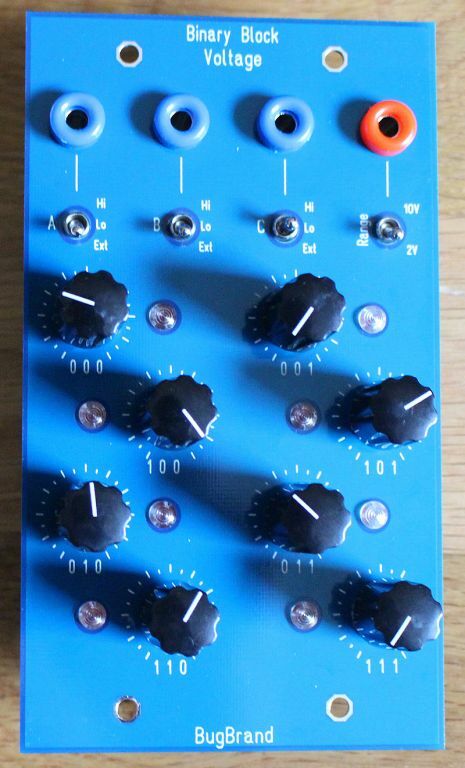 The DC Mixer feels like a useful modular block. Anyways, just to say that ideas continue to evolve - there are more modular ideas swirling - with a definite personal NEED for clocking utility (that's always been a great driver for me) but I don't think my initial ClockBox idea quite hits it. Maybe more Modular IS really a better approach. Re-did the Diode Director (UTL6C) 'cos that's simple & useful. So what is this intriguing device ^^^ and what does it do? Not familiar with it's predecessor. My guess is that it's like a one channel sequencer with binary-coded stage selection and no "advance" or "clock" control. You send in three CVs on the blue jacks. Tese are interpreted as logic high or low levels, so the input is a binary-coded number from 0 to 7. This selects one of the pots, whose setting determines the voltage level that goes to the output. How did I do, Tom? Part of me thinks I must be wrong because this would be sort of the opposite of a clocking module. It is like an 8 step preset voltage source - one voltage is selected at any one time depending on the 3-bit binary inputs (A B C). --- see the numbers by each dial? Well, that's the binary code - it is quit logically laid out! You also get to scale the output voltage - either narrow (0 to +2V) or wide (0 to +10V). So you can either manually switch the switches to select a stage. Or a mix of the both. EG - if you had clock divisions going into A and B - you could manually switch C from Lo to Hi and then you'd shift the sequencing from the Left side to the Right side. By careful choice of inputs you could get it to sequentially step - but the desire is more to get away from pure regulars! Clock division - can't help but feel like having all division outs available on at least one divider would be necessary. Driving things at different related speeds is simple but really effective (have been watching a LOT of darenager's old system vids), doing this via the quad divider would eat up a lot of precious outs. I do, however, think some element of playability on the divisions is an important twist.... placing the diode director next to a multi-out divider fills this role? Not as elegant a solution as the rotary switches though. Personally I'd like to see the divider and logic sections stuffed to the max with i/o alongside something very simply playable that they can be patched/combined into and played out of. Some sort of switch/button bank? Such a utility module would also allow the binary block to be 'played' with fingers - similar to the Lorre Mill keyed mosstone. DDSR - Love this module. It's perfect, a real winner. So many applications packed into 3fw. The gate outs pair amazingly with 2bit bin mux for an extra layer of movement so can see the binary blocks being an even more wonderful pairing. DC mixer - definitely 100% needed! - haven't really felt the need for dual. - a stop/start control would be good. - perhaps divisions built in. Yep... that's the sort of feelings - nice having the switching but gets used up too quickly and constrains in some ways. stop/start yeah! That would be so unbelievably useful. If that stop/start could be paired with a gate out to optionally feed reset inputs of supporting modules (dividers/linear sequencers) that would be magic. Ahah think a lightbulb just turned on - thanks Tom. Binary Block is a must have for me! Is the right hand side of the clock utilities a switch? Looks like a cool module! I forgot. Think you showed us something like that. Seems a great general purpose combination. Yes indeed. for modules that make me think and experiment again. YES!!!!!! Nice update, always interesting to see how things are moving along. The original ClockBox looks great, though I can appreciate the distillation process. The main case I can think of for the dual clock is having swing applied to one and not the other... I wonder if that could be split to two outputs from a single clock (with one of the outputs having variable amount of swing)? Always in favor of having more functions in a smaller space. I guess the benefit of dual modules is that they might save ~1FW from the shared circuitry when doubling up? I could imagine the voltage block would be great with the DDSR, DC Mixer, and a quantizer for adding some scales/harmonic structure into the mix. 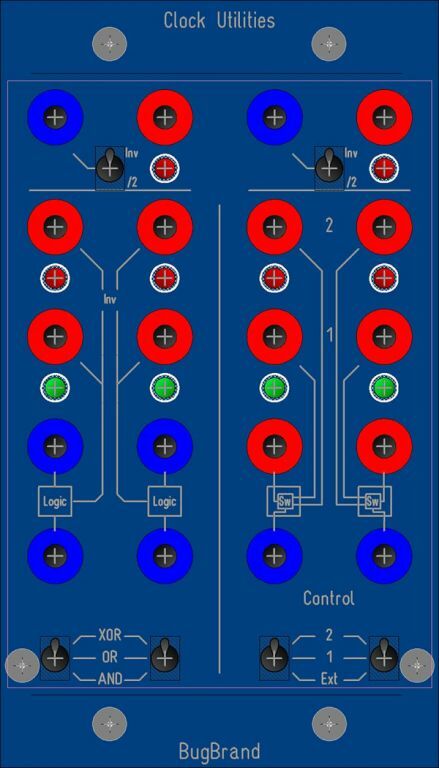 It would be very cool if one of the Voltage Block inputs could alternately do the AD conversion (single input instead of 3)... making the Voltage Block itself into a sort of funky quantizer. Played with a varying envelope shape, could be fun. After a few messages, I realised that I made out that the QDiv was already dead-in-the-water -- I'm going to check more next week, but really the feeling was that doesn't feel like the ONLY approach for divisions. Dang, that Binary Block Voltage looks ACE! I'm imaging that catching a couple of the D/A outs from the DDSR and maybe a touch gate from the Joystick/Touch or CTL1... fantastically playable! Oh and deeply liking everything else in this thread too! Holy bugs!! My search for UTL6B has ended!! Just looking at that Clock Utilities module - the two identical switch sections at the top - is that a divide by 2 below what I presume is an inverter? Flipping hell - hope this one becomes a reality! As I understand it the two jacks either do divide by two or inversion, depending on the switch. edit: I was too slow.